Someone has to say it: Creativity in web design is becoming endangered, and off-the-shelf content management systems are largely to blame. You might already be asking yourself what the back-end of a website could possibly have anything to do with the front-end design. Let me explain. I’ve been writing a lot lately about flexibility with regards to custom or decoupled/headless CMS platforms and how they compare to off-the-shelf platforms. It’s pretty easy to make a case for why custom systems offer more back-end flexibility than the monolithic, coupled systems. With a custom CMS, you can design your admin interface from the ground up, uniquely centered around the way you do business or what your content creation efforts require. Typically, this includes developing admin tools around your website’s design rather than designing the site according to what your CMS can manage. Headless CMSs also offer the same flexibility: rather than content being defined only as posts or pages, you can define it any way you deem necessary, according to your own taxonomy. But can one make the case for how a custom content management platform or headless CMS enables you to be more creative with your front-end user experience? By separating the front-end and back-end logic, you gain the ability to choose from a deeper selection of front-end technologies to power your front-end experience. Literally, you have a blank canvas to start from. This, in turn, results in the ability for a savvy creative lead to design and deploy stunning front-end experiences for your brand while still allowing your marketers and content creators to maintain control over the content. Let me take a few steps back to explain how we got here. When you look at all the advancements in front-end technology over the last 5 years, you can see that things have changed rather quickly and dramatically. I like to tell people that while back-end technology moves slowly, front-end is ever-changing, constantly responding to new devices and new methods of content consumption. As mobile and tablet devices became more and more popular over the years, the technology had to keep up and provide solutions to enable content distribution to those devices, not just the ol’ desktop-based Web. At the same time, CMS platforms didn’t change all that much, at least not from an architectural perspective. After all, a CMS should, at its core, complete a fairly simple set of tasks: add, edit, delete, and organize content. The front-end does the heavy lifting of displaying that content for the end user, so open-source projects didn’t work to differentiate their platforms on the technological or architectural side. They just doubled down on what they already had, further bloating their software in a mission to make it work for as many use cases as possible. The point where these off-the-shelf platforms were caught off guard was when WHY technologies like Angular.JS were developed. Platforms like Drupal and WordPress heavily invested human hours in an attempt to update while still avoiding the elephant in the room: the fact that the admin experience, codebase, and platform were still coupled closely with the front-end user experience, all designed with only the Web in mind. But now, front-end technologies are being built to interact with data differently—this time, via an API. The advent of omnichannel delivery has made this essential. Thus, teams developing new front-end platforms are solving the problem of developing fluid, single-page user experiences by taking advantage of this new standard. They’ve realized that the future of content delivery isn’t via tight integration with proprietary theming engines offered by integrated CMSs, but rather with codebases that can interact with data, manipulate it, and present it on any channel by requesting it via—you guessed it—an API. And because these frameworks are aimed at gathering data from a remote source, they have ushered in this new era in content management that we speak about so often: the headless or decoupled content management architecture. Finally, people are taking notice! 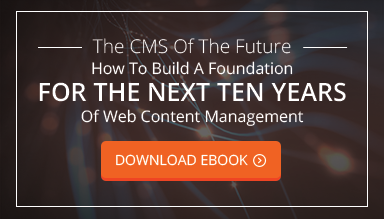 As of the writing of this post, there are at least 20 providers of hosted Content as a Service (CaaS) platforms, and many other CMS platforms that can be taken off the shelf that work in a similar manner. So back to my main point: How does creativity begin on the back end? By choosing from the new generation of CMS platforms—either custom-built or decoupled and provided as a service—you are opening your project up to a deeper catalog of available solutions. And as an added bonus, you’ll also have more flexibility in controlling your content and more tangible security benefits. Why is creativity in web design so important? Because the Web is suffering greatly from a plague of “sameness.” The inundation of the internet by content management systems with preloaded themes is making every website look and function the same. Creativity has become nearly null and void because clients have been trained to accept this monotony with the idea that they have to catch up in order to play ball, even if it doesn’t look good. It is analogous to every house being built with the same foundation, the same blueprint, the same materials. Where else could the creativity in design or layout go with such sameness being so ubiquitous, except out the window? The future is headless. Not just because it makes the most sense, but because the Web as a venue for creative expression needs it. Because all old technology must make way for newer, better methodologies. It’s only by embracing these new technologies that we can begin migrating into the next era of truly creative and interactive web design.